My very best wishes to all of my readers and thank you for your support. of my poetry for APRIL. SOUTH 59 will be launched on MAY 22nd in Basingstoke. See www.southpoetry.org for full details. Delighted that I have poems in Acumen and the forthcoming SOUTH 59, together with a review of "How The Light Gets In" in HQ Poetry Magazine No. 50 (See below). HERE IS THE COVER OF MY NEW BOOK, A SELECTED AND NEW COLLECTION OF MY POETRY. sentimental. A modern Edward Thomas in some respects. elegiac meditation. A varied and very satisfying collection. description of locations in Cornwall, mark this as a special collection. Adrian Green, Adjudicator, Littoral Press, Nature Poetry Competition. the sorts of places where many of us live or visit on holiday. world and its links to man's environment and spirituality. previous five collections of poetry. How The Light Gets In is beautifully produced by my publishers Dempsey & Windle. A special “Thank You” to my editor, Janice, for her attention to detail and excellent cover design. I am delighted to confirm that Donall Dempsey and Janice Windle will be two of the readers at the launch of my book. Patrick B. Osada lives in Berkshire – and I was born and bred in Berkshire...and as many poems in his new collection How The Light Gets In (Dempsey & Windle, £9) have their roots in Berkshire, this book comes into my hands already drenched in reviewer bias. The Royal County is rightly symbolized by the Oak and Hart, and these poems are equally dignified and animate, full of the tension between stillness and movement. Old and new poems alternate in the selected new poetry collection of Patrick Osada with particular attention to nature, especially plants and birds, and his concerns about the environment, which seems to change too quickly. The book is divided in three sections, Nature, Place and Spiritual, but the poems are not linked only to one topic, on the contrary, the three themes often interweave in most of the poems. The ‘pleasure’ and ‘rapture’ that nature inspires and the poet’s profound love of the environment are reiterated in many pieces. There is an attentive, minute observation of the flying of birds, their migrations, their imperceptible movements and the essence of their singing; they are caught in elegant lines and evoked in sounds that engage the reader in a multi sensory experience. Nature blooms and dies, freezes in white cold nights or bursts in lush vegetation; compelling poetic images reveal a profound communion with the environment. This contact with nature that rebirths every spring, makes being human more ‘human’ and is perhaps the core of our humanity; whereas our spiritual side might be constantly haunted by the end of our physical being. It is a constant effort of renewal where light and shadow take turns in the memories of the loved ones. The power of spring is revealed in birds’ songs, in the ‘smell of garlic’, and in the relentless blossoming of the blackthorn in spite of winter’s harsh winds. Though winter is fascinating with its ‘icy flowers’ and ‘snowflake petals’, nature is frozen, animals rest and can only ‘dream of spring’. Surprising old crows and the secretive jay. cautious birds: dunnocks, chaffinch, secret wrens. darkling flock shape-shifts in setting sun. invisible to all but these strange birds. But nature is not only joyful and lively, death lingers in its folds, present and inevitable in the hawk feeding on a robin, ‘pausing, head cocked, aware of every sound’, or in the crows whose ‘shadows caw across the stubbed field:/Black harbingers who come with tales of death’. Life mingles with death in a natural flowing that does not seem to affect the wildlife’s harmony. While all the time my thoughts just turn or spin. Light on water, timeless place, salt air and acumen. The word ‘change’ recurs in these poems underlining environmental concerns about people’s unscrupulous destruction of nature, where ‘scaffold poles’ take the place of trees and ‘hard-hatted men with cruel machines/soon make the torn earth die…’ (‘When’). The geese cannot find their place in the countryside where new houses have been built and green spaces are less and less. Eyes fixed, a final glare of grief. The future seems uncertain, the afterlife a question mark, but nature comes again to the rescue. Though people are dead, their gardens bloom in the unbroken cycle of seasons that brings everything ‘back to life’. The final poems reflect these two moods in striking images. On the one hand, the’ heart’s red rage’ and ‘the bird of black despair’, on the other hand, ‘the blueness air and water’ and ‘Liquids of air, fused on the mountain top’. The poet carries on, dreaming and praying for peace with the words of an ancient Celtic Benediction (‘Saying Goodbye’), ‘Uncertain that my memory serves me well’ (‘Anniversary’). It is an elegy to a loved one, painfully missed, but present. It is a wish to grasp life in memories that are fading but still there. This is an enthralling collection that brings nature and the unpredictability of human life to light. intertwine. He shares with us the “pleasure” he finds like Byron “in pathless woods”. haikus in “A Week of Frost”. girl” and also the touching “Still Life with Feathers”. An earlier poem “Beyond St Clement” begins with “silent contemplation” and ends with “Light on water, timeless place ... and acumen”. In this collection we find acumen, euphony, wit - Patrick Osada at his contemplative best. A “natural” poet, a distinctive accessible voice that moves, provokes and opens our eyes to the “pathless woods”. He shows us “How the Light Gets In”. Patrick has been writing poetry all of his adult life. His first success came with a prize-winning poem in a national poetry competition. This gave him the confidence to submit his work more widely, leading to regular publication of his poetry in many of the leading poetry magazines. Patrick’s first collection, CLOSE TO THE EDGE was published in 1996. It won the prestigious ROSEMARY ARTHUR AWARD and was submitted for The Forward Prize. His second collection, SHORT STORIES : SUBURBAN LIVES was published in 2004 followed by ROUGH MUSIC in 2006 and CHOOSING THE ROUTE in 2010. HOW THE LIGHT GETS IN, was published in 2018. 1.What inspired you to write poetry? 2.Who introduced you to poetry? As I have already explained, I was introduced to poetry as a very young child. However, as a teenager, I was only interested in sport, any kind of reading – let alone poetry – was viewed as a chore and imposition. My saviour was a teacher called C.A.Broome who introduced me to the poets of the First World War as part of my “O” level English course. Suddenly the poems of Rosenburg, Thomas, Blunden and, particularly, Owen, Sassoon, and Henry Reed totally captured my interest and imagination. I realised that poetry could move me in a special way…and I was hooked. 3.How aware were you of the dominating presence of older poets? From my introduction to the poets of the First World War, I discovered that two famous war poets, F.W.Harvey and Ivor Gurney, were both linked to my home county, Gloucestershire. Later I discovered their association with The Dymock Poets, including Robert Frost and Edward Thomas. At college, my studies introduced me to poets varying from Chaucer, Dryden, Milton and Shakespeare to Keats, Coleridge, Byron, Shelley and Clare. 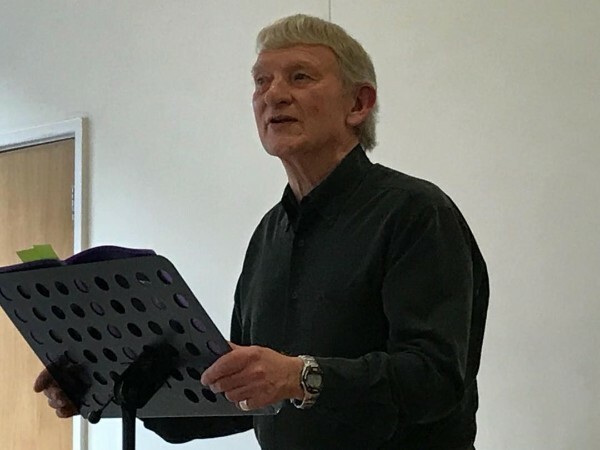 One of my tutors, the famous Welsh poet Leslie Norris, introduced his students to a rising star, the Sussex poet, Ted Walker. I discovered Dylan Thomas, Betjeman, Larkin and Hughes and went to the Royal Albert Hall to see the “Beat Poets”, including Ginsberg, Ferlinghetti and Corso with the British poets Adrian Mitchell and Michael Horovitz…So, as you can see, “the dominating presence of older poets” has always been with me, ‘though I always have regarded them as inspirational rather than dominating. 4.What is your daily writing routine? 5.What motivates you to write? I’m not sure how to apply this question to writing poetry! In most other things hard work equals reward, but in poetry I suppose a successful poem brings personal satisfaction. 7.How do the writers you read when you were young influence you today? 8.Who of today’s writers do you admire the most and why? Sadly, most of the poets I admire are now dead. I don’t think there are any poets writing today able to match, for instance, Larkin, Hughes, Gunn and Heaney or the three Thomases – Edward, Dylan & R.S. Of living poets I would mention Motion, Duffy Michael Longley and Americans, Sharon Olds and Thomas Lynch. I probably own more collections by Gillian Clarke than books by any other living poet. I admire the way she blends traditional writing skills with her ability to capture the Welsh countryside and its people. Two poets I know personally and would recommend are Ian Caws (an Eric Gregory Award winner) for the wonderful way he records life on the Sussex Downs and coast – his technique is sure-footed and his rhyme unobtrusive; Andrew Geary, a newcomer whose first collection, “A Shoal of Powan,” promises great things to come. I write because I have to… As I said earlier, writing poetry is a compulsion, something I will continue to do until inspiration and “my muse” desert me. In the first instance, I write for myself – to satisfy this strange compulsion to express myself in a written form. A lot of my early poems were not shared with anyone. Eventually, I mustered the courage to show my work to family and friends, then to seek publication. I am currently promoting my 6th. And latest collection, “How The Light Gets In”… As this is my latest “project” it is receiving a lot of attention – however, I am glad to say, my poems are still being written! SOUTH now has a Facebook Group page, look there for information about each new edition of SOUTH. Deadline for submissions to SOUTH 59 was November 30th. Submissions are now closed. this website...see bottom of this page for details! avoiding the heaviness that can sometimes come with full rhyme. fame.’ No need to name the poet or the writing here; Osada trusts his readers. transforming these into words hold everything together. “What a gorgeous collection of poems! "I was drawn to the poems about Patrick's parents towards the end of the book. SUNFLOWERS and HAWK attracted me very much, though, with such an even collection, it seems almost wrong to pick poems out. It is such a satisfying collection ...A good book to have." the wonderful To the End of the Road, about learning to ride a bike with his dad. Rough Music (ISBN 1 -904781-48-9). BIOGRAPHY & bOOKS AT THE TOP OF THIS PAGE.